After what seemed like way too many OMG-we-have-to-go-Campsie-Korean-soon rants, yesterday M & I finally enacted on our plans. 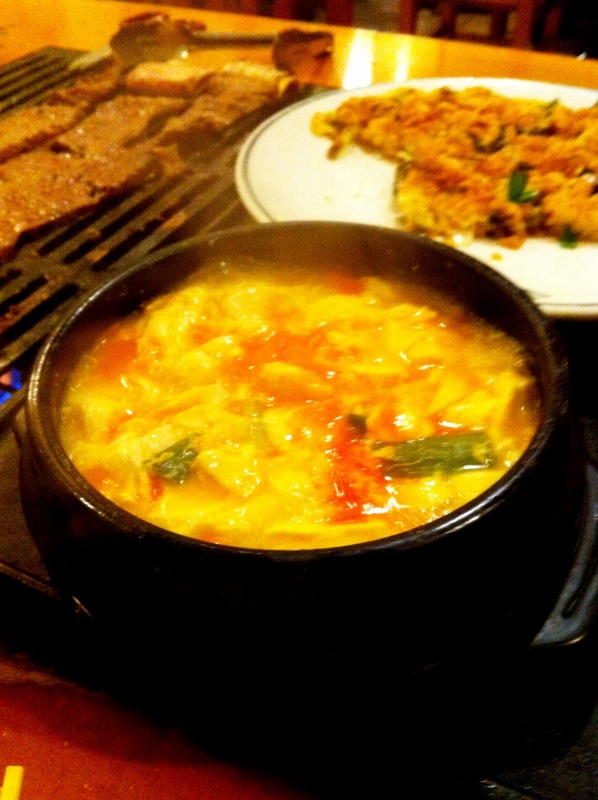 It was probably the perfect night to go to Se Joung as it was quite cold and most importantly, we were starving. Se Joung is quite a low-key but cosy Korean Restaurant at Campsie, oddly positioned on the ramp leading to Woolworths. Although there is no english name on the shop front, most do know this place to be Se Jong. I used to live in this area and thus often, grocery trips to Woolies led to a quick dinner at Se Joung. The restaurant is divided into two areas: a general table and chair seating arrangement in addition to a traditional Korean-Styled dining area whereby diners take off their shoes and sit crossing their legs on cushions with low tables. I prefer the traditional style but we were guided to the normal seating that night. Almost everyone is eating BBQ and so the sizzling smells of meat that surrounds you alone, can tantalise your senses to its extremes! Se Jong, as M will constantly praise, is known reputably for its' Seafood Pancake ($14) and so it is a must-order! When this gigantic golden-yellow plate flashed before us...lets just say I have never seen M so engrossed in his food. Indeed, the batter is fried to a delightful crunch and each bite is full of prawns, spring onions and squid. Definitely more special than your usual Korean joints. Considering the amount of food we ordered that night, we decided to lay low on how much rice we ate. Instead, for most of the meat, we wrapped it in the lettuce leaves that were provided and this allowed it to go down feeling less oily and heavy! The Galbi was absolutely delicious!